Tomorrow night, Friday, February 8, is the beginning of a long and prosperous relationship between Concord Joe, the Merton Hotel, and YOU. 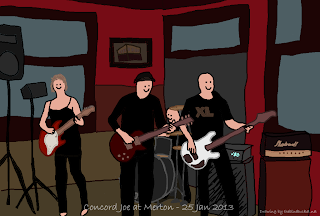 Every month, Concord Joe will be playing at the Merton on the second Friday of the month. You can bank on it. So come to see us. We look at LEAST as good as the picture here. Maybe better. Live music and the rock and roll revival depend on punters fronting up to the pub and having (gasp) FUN on a Friday night. Let’s make it so. Blues infused, rock-n-roll band, Concord Joe, is based in Sydney Australia. The four piece band is putting the final touches on the first four fully produced original songs.